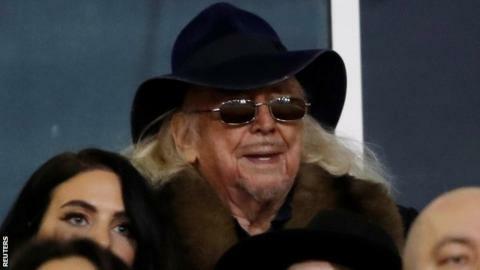 Blackpool owner Owen Oyston and his daughter Natalie Christopher have been removed from the board of the troubled League One club. Receiver Paul Cooper, of David Rubin & Partners, has appointed ex-Manchester United chief operating officer Michael Bolingbroke as boardroom consultant. Ben Hatton has been appointed executive director/managing director and Ian Currie a non-executive director. Blackpool were put into receivership by the High Court on 13 February. That forced 85-year-old Oyston to pay former director Valeri Belokon the £25m he was owed. Oyston was ordered to buy Belokon out for £31.27m in November 2017. "I am delighted to announce these appointments," said Cooper. "I believe they demonstrate the high calibre of individual, who is prepared to work with all the stakeholders of this great club to ensure it can perform at the highest level in the most professional, transparent and optimal way." The new appointments all comply with the English Football League's owners and directors test. Former Inter Milan chief executive Bolingbroke worked for Manchester United for seven years from 2007. Hatton also worked at Old Trafford from 1997 to 2007 as director of commercial enterprises, during which time the club's turnover increased from £67m to £301m. Fleetwood-born former Blackpool season-ticket holder Currie, who is a director of an independent investment management and corporate advisory business, was non-executive director at Bolton Wanderers for six years. Cooper has also appointed another Blackpool supporter, Tim Fielding, to represent fans on the board, in "an observational role, with no voting rights". As well as being removed from the board of Blackpool Football Club Limited, Oyston and fellow director Clive Brooks were removed from the board of Blackpool Football Club (Properties) Limited. The moves end Oyston's official involvement with the Lancashire club for the first time since he bought shares in 1987, prior to becoming the club's owner in May 1988. Former Blackpool chairman Karl Oyston - Owen Oyston's son - is suing the club in a dispute over wages. Karl Oyston was chairman of Blackpool from 1999 to February 2018. Blackpool lie ninth in League One, just six points off a play-off place, despite having been subject to a long-standing boycott of home games by fans. Supporters have protested against the Oyston family for several years over their running of the club. Blackpool now face two away games, at lower-half sides Bristol Rovers and Accrington Stanley, before they next play at home - against Southend on 9 March. Captain Jay Spearing hopes that there will be a good response at the turnstiles. "This can only be good news for the club, and especially for the fans," he told BBC Radio Lancashire. "It's something they've always wanted and I'm happy for the fans, as well as for the players and the staff. "It's a proud feeling being captain of this great club, with the history it has. But walking out in front of maybe three or four thousand fans, you look at the rest of the empty seats and wish it could be full. "There's a lot of football to be played before then but I'm hoping I'll be able to lead the lads out on 9 March in front of as many thousands of fans as we can bring back." Blackpool are still under threat of a 12-point deduction for going into receivership. But EFL chief executive Shaun Harvey has already stated that the punishment is not necessarily a mandatory one. A decision is likely to be made at the next EFL board meeting on 6 March.